£190.00 plus silver costs (estimated at £20.00–£80.00 dependent on weight). Wax carving is a really interesting and effective method of making silver jewellery. The process involves carving a piece of wax into the desired shape. Once cast this becomes a silver copy of the shape you carved, ready for you to sand and polish. The emphasis on day one of the course is on wax modelling for lost wax casting. Wax carving and wax building is accompanied with a detailed description of the lost wax process and multiple casting methods. We cover cuttlefish casting for direct casting and drop casting on day two of the course for fun, experimental, instant results. 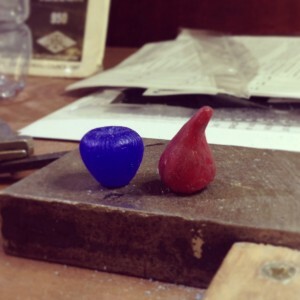 Photo shows two different types of wax – carving wax and moulding wax. You will experiment with both types over the weekend. Begin to realise your jewellery designs in three dimensions without the waste of metal produced in fabrication. Understand the ease related to batch production and the advantage of being able to produce identical units for a complicated linkage. Very intricate, identical pieces can easily and quickly be made.